Eighteen people were killed in a blast at a Chehlum precession in Khanpur‚ district Rahim Yar Khan – Pakistan Radio. Eighteen people were killed and more than thirty others injured in a blast at Chehlum procession in Khanpur‚ district Rahim Yar Khan on Sunday, 15th January, 2012. Eighteen people were killed and more than thirty others injured in a blast at Chehlum procession in Khanpur‚ district Rahim Yar Khan on Sunday. The twenty-two injured persons have been shifted to Sheikh Zaid Hospital Rahim Yar Khan. The DPO Rahim Yar Khan said there is possibility of a bomb blast and bomb disposal squad is investigating the matter. President Asif Ali Zardari‚ Prime Minister Syed Yousaf Raza Gilani‚ Information Minister Dr.Firdous Ashiq Awan and Interior Minister Rehman Malik have strongly condemned the blast. Meanwhile‚ Chief Minister Punjab Mian Muhammad Shahbaz Sharif has announced compensation of half million rupees each for the heir of dead persons and one hundred thousand rupees for the injured persons. 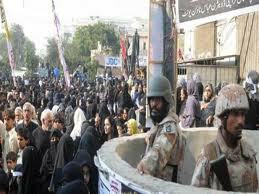 A suspected home-made bomb exploded near a Shia Muslim procession in the central Pakistani town of Khanpur. A homemade bomb has exploded near a Shia Muslim procession in the central Pakistani town of Khanpur, killing 18 people and wounding 30, according to police officials. The remote-controlled bomb was planted near an electricity pole, said Sohail Chattha, the area’s police chief. He said it was set off as the procession approached. 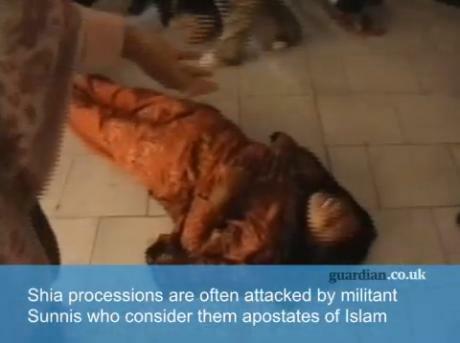 Processions of Shia Muslims, who make up about 20% of Pakistan’s population, have often been attacked by militant Sunni groups who consider them apostates of Islam. Sunday’s procession was in observance of Arbain, or Chehlum, one of the main religious observances in the Shia calendar. Sectarian strife between Pakistan’s majority Sunni and minority Shia militants has intensified since Sunni militants deepened ties with al-Qaida and Pakistani Taliban insurgents after Pakistan joined the US-led campaign against militancy after the 9/11 attacks on America. Report from Other Source : Chehlum procession blast leaves 20 dead in Khanpur. 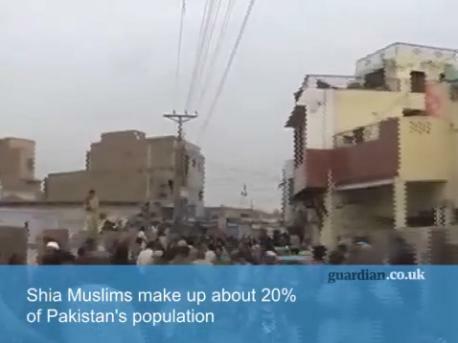 Source Courtesy : Reuters | The Nation Pak | SANA | The Guardian.